Once you reach the trailhead (shown by an orange star on the map above), you will begin hiking through the woods (yellow path on map). The route to the top of Mt. Hayes follows the Mahoosuc Trail and is marked with blue blazes. The route can be a bit wet in the spring and early summer. The trail starts off gradually and quickly crosses some power lines. 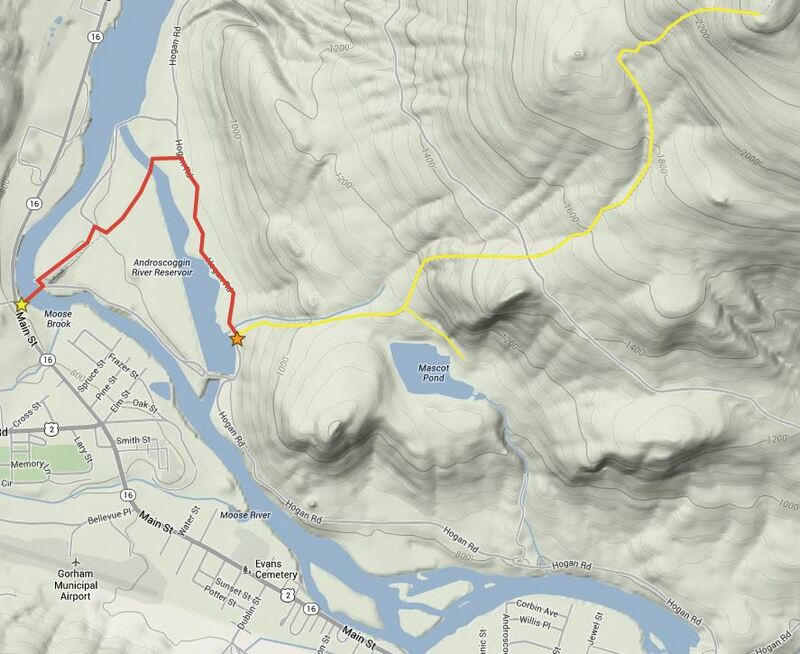 After half of a mile, there is a spur trail on the right to Mascot Pond, which also makes for a very nice destination. Shortly after there is a short steeper section before the path levels out and crosses over a dirt road. On the far side the trail climbs moderately through some muddy sections before one last steep section to the top. Before you reach the actual summit, there is a small path to the right which leads out onto some fabulous ledges with great views. This is a great place to have a picnic lunch, eat a snack or simply relax and take in the views. From here, you can continue on the Mahoosuc Trail if you want. The actual summit is .3 miles further but doesn’t offer a view and is just marked by a cairn. For most people, the ledges are a good destination. Return to your car on the same route you took up.